Mumbai, January 28, 2013: Apeejay Stya & Svran Group has been conferred the prestigious “Medici Innovation Hall of Fame for Excellence in Innovation Processes”. The award is part of Medici Institute’s recognition process of different organisations in the field of strategic innovation and its implications. The award has also been received by ICICI Bank, Tata Consultancy Services & WLO Global Service. The award was designed by Titan Group of Companies and was partnered by The Medici Institute, Harvard Business Review & Customer Lab. The award ceremony was part of the “Reverse Innovation Meets Medici Effect” thought leadership event led by Mr. Vijay Goovindarajan, World’s No.3 ranked thinker and Mr. Frans Johansson, the acclaimed practical innovation guru at Hotel Trident, Mumbai. 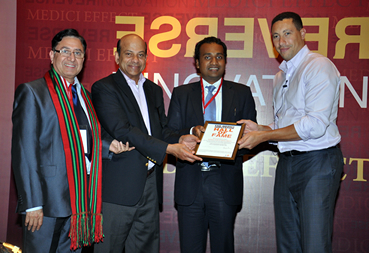 Mr. Aditya Berlia, Member, Board of Management accepted the award.